MySQL to MSSQL Database Conversion tool provides an extensive solution to convert entire or selected database records created in MySQL to MSSQL database server as per user needs. MySQL to MS SQL database converter software migrate database from MySQL to MS SQL format. Software help you to convert views, queries, indexes with all necessary attributes and also support all major data types. 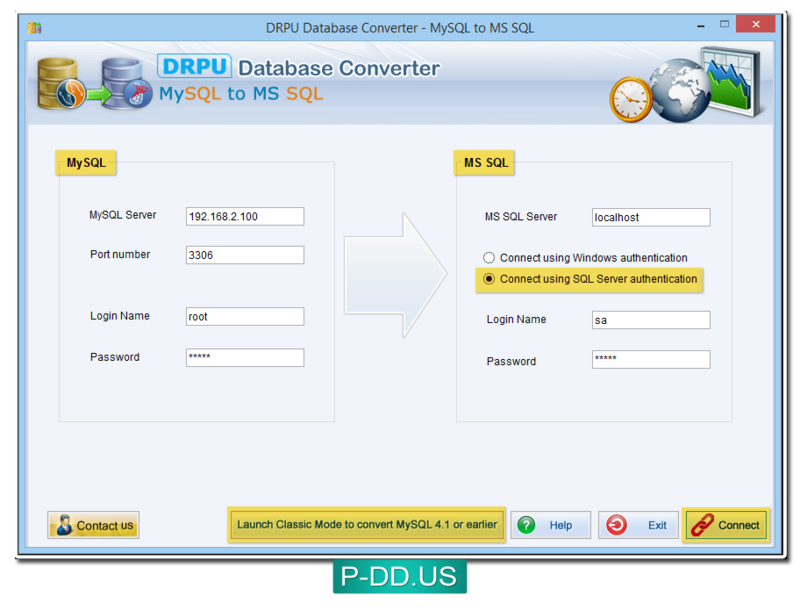 This database conversion tool has capability to work with latest version of MySQL as well as 4.1 or earlier versions of MySQL server. Database Migration utility supports Unicode architecture set and maintains database integrity even after database conversion. User friendly and easy to use database file conversion software facilitates to overwrite converted database at subsisting database or saves converted database records at new location specified by the user. Establish connection between MySQL to MS SQL server by clicking on “Connect” button. You can connect server using either Windows authentication or SQL server authentication method. Precisely convert bulk MySQL database or selected database records according to user’s need. Easily convert MySQL database into MSSQL database server in just few minutes. Support Unicode architecture set and maintains database integrity. Support all MySQL database data types and attributes. Support all latest versions of MySQL and MSSQL Database Server. Also works with 4.1 or earlier version of MySQL server. Overwrites converted database into existing database or save converted database at new location. Simple and reliable database converter software facilitate with user guide support.